After John Howard Griffin's escape from Nazi-occupied France, he was shipped to the South Pacific, where he was stationed as an isolated observer in the Solomon Islands. That experience led to his second novel, Nuni (1956). As in his first novel, The Devil Rides Outside, an American professor is confronted by an alien reality. In Nuni, that reality is a "primitive," almost Neolithic society. Yet, the professor's intellectual accomplishments are useless here, his place in both family and civilized society meaningless. He learns to cope, not so much in terms of survival as in finding a new meaning to his life. 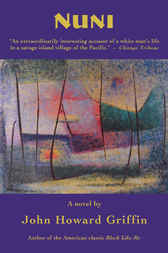 The Chicago Tribune described Nuni as "an extraordinarily interesting account of a white man's life in a savage island village of the Pacificthe greater part of the novel is concerned with the growth in the narrator, a knowledge of as well as affection for the curiously innocent people." The Dallas Times-Herald wrote: "The two greatest novels of the past decade are William Faulkner's A Fable, and John Howard Griffin's Nuni."